1966 – Texas Western College defeated the University of Kentucky to win the Men’s NCAA tournament championship in College Park, Maryland. 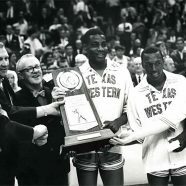 The game was significant in that Texas Western started five Black players, the first time an all-black starting five had won the NCAA championship. Kentucky started an all-white team and and was favored, but the Miners pulled the upset of the Wildcats, coached by Hall of Famer Adolph Rupp.